I’ve been in and out of aid stations my whole life. From Maryland, to Madeira Island, to France. From European electrolyte drinks, to bananas, to chocolate. From efficient transitions, to speed-eating chow downs, to chewing and chugging misery. From taking enough, to taking far too little. From finishing strong, to blowing up. I’ve seen a lot in my short time as an ultrarunner. I’ve lived and learned, succeeded and failed, struggled and triumphed. No matter the outcome, however, I’ve always learned. In 2014, it was Les Templiers in France. With roughly 10 kilometers to go, I clawed my way up the second-to-last climb and into the final aid station. A fingertip grip on the lead, I feared getting caught. With a mere five kilometers or so to the finish, I thought my use of the aid station would be critical. In and out fast, is what my brain screamed. Grab some aid and book it! Swapping out my pack for a new one, that’s exactly what I did. In the heat of the moment, it seemed like a good decision. A few hundred meters later I found it to be anything but. As my fingers tingled and my body struggled, I slammed a gel with the hope of resurrecting myself. For a brief moment my body may have started to come back, but any such signs of hope were short lived. I needed way more calories, but my snack stash was tapped out. I had grossly underestimated what my body would need for the last five kilometers, and now I was paying the price. Over the next couple of miles I fell from first to fifth. In the final push to the finish I tried to run, and I thought I did, but live race coverage revealed a very ugly finish-line ‘march.’ It was a bonk of epic proportions. In 2015 it was Madeira Island Ultra-Trail. It was right around daybreak when it happened. I had been running strong since the race start at midnight, but a short ways from an aid station that lay just before one of the biggest climbs of the day, I started to struggle. With all of my gels and liquids gone and a body crying out for calories, I was in trouble. Desperate to fix the problem, I pulled out a bag of GU Roctane powder and ate it straight up. Bouncing back to life, I charged into the aid station. Realizing that I would need far more than a bit of Roctane powder to get me through the rest of the race, I attacked the aid station like Joey Chestnut at a Fourth of July hot-dog eating contest. Chocolate, oranges, and soda flooded into my mouth with extras going in my pockets for later. For the next seven hours or so, I would climb and descend, eat and drink, hurt like heck, and press on nonetheless. I would find moments of need and acknowledge it, but unlike Les Templiers I would actually accept the help. Earlier this winter it was Barr Camp. He wandered into the cabin sometime on a Sunday morning or afternoon. His name escapes me, but I remember the mannerisms. He was chatty, edgy, and unsettled. He exuded a vibe of something not quite right. The kind that generally makes you yearn for someone else to converse with or an outside chore to escape to. Fortunately I did no such thing. Instead, I sat right next to him and chatted away. He went on and on about his troubled life. He spoke of success and failure, getting his life on track and then derailing it. He talked of jail time, drugs, girls, bars, and his desire to be free of it all. The stories revealed a troubled soul, but also a person who longed to do better. As I lent my ears that day, I tried to be the aid station that this man so desperately needed. Remarkably, I wasn’t alone. With me in the cabin that day was a man who had camped out the night before. Unbeknownst to me, this man had experienced some of the same struggles. He made a gracious effort to do what he could to help. Then, a good while later, dear Ann came walking through the door. A regular on Barr Trail, Ann is an absolute gem. Though I am unsure of her age, 70 would be a good guess. Kind as can be, she calls us the best tea house in the world, and always overpays. As sweet as they come, Ann bought the man a cup of tea and a snack. But, she didn’t stop there. Ann took the time to talk to the man, sharing not just her material wealth, but also her kindness. Eventually the man thanked me for listening and returned to the trail. Much like a runner in a race, he didn’t depart problem free. His problems and temptations would be waiting for him out there on the trail. What he did have was that breath of life that a good aid station can bring. Would it be enough to fix all his problems? Probably not. But maybe, just maybe, it would be enough to get him through to the next one a little ways up the trail. Looking back, I now realize that each experience taught a different lesson. Les Templiers taught me the importance of recognizing a need. It’s hard to know at the beginning of a race how you will feel 20 minutes later, let alone 20 miles later. We expect the ascents and descents that naturally come, but some hardships sneak up on us out of nowhere, like a stomach flip that keeps you from taking in any calories. Some obstacles keep you from the things you need, like calories or good attitudes. It’s the kindness of others that can kick in during these moments. The Bill Doopers of the world. The fellow runner who doesn’t threaten your heart rate but latches onto your pace like a metronome and somehow creates more momentum. The aid-station rests that save you from the hours of regret. And yet, while the help is often there, oftentimes our recognition of our need is stubbornly absent. And so, in running and in life, we must learn to acknowledge our needs. Madeira taught me the value of accepting help. As an independent person, I have a tendency to resist help from others. I clam up, hide, and stubbornly try to do things on my own. It is quite natural to not want to show our weaknesses. In junior high school I used to stifle my breathing to keep others from knowing how hard I was having to work, but don’t we all know how much worse that only makes things! More recently I have gone through a tough circumstance, but rather than stifle my breath I have managed to open up and accept the aid station. It has been a beautiful thing and makes the resisting look so foolish. Life is so much better when we choose to share our load and commune with others. It actually creates more solidarity and by normalizing our pain, it lessens its grip on our circumstance. As I experienced in Madeira, it is our acceptance of the aid-station community that helps us through. Barr Camp has revealed to me the value of being an aid station. Not because it is a debt to be repaid, but because I recognize the immeasurable value of a smiling face at the base of a climb. In running, it’s good to give back by volunteering. In life, it’s important for us to stay attentive to those around us and offer support when needed. Sometimes this happens with people we know, our friends and family. Other times, like at Barr Camp, it occurs with complete strangers. And sometimes, planned or not, we team up with others and it becomes a communal effort. Zach Miller and Jim Plunkett-Cole at Barr Camp. Photo courtesy of Zach Miller. And so, aid stations are multi-faceted, and we mustn’t forget the power that they hold. At aid stations it’s warm, inviting, and cozy. There is plenty of food on the table and friends laughing. Some people run through, failing to recognize their need. They often pay for it later. Others stop, choosing to accept the help before going back into the dark, cold moments of solitude. And further yet, countless folks act as an aid station for someone else. Whether in running or in life, we’ve been blessed by the provisions, friends, and family–the warm light and the laughter. We’ve filled up, left, emptied out, and returned once more. Some long to be self-sufficient, but the idea isn’t to figure out how not to need an aid station. The idea is to figure out how to be present and useful in one. Every person and every point in time is so unique–some to bring refreshment and aid, and some to go out and battle the dark. May we all learn the art of the aid station: the acknowledgment of need, the acceptance of help, and the power to lend a hand. What aid stations have been noteworthy for you in racing? As in, do you remember one that particularly saved your bacon when you needed food, drink, warmth in bad weather, or a friendly face? Do you have any stories from when you have volunteered at an aid station during a race? And how about the aid stations of life? When has a person or place been a source of comfort and recovery in a time of need? One of the best posts I’ve read translating what we face in running/races to real-world application. Phenomenal. Keep them coming Zach. Well done Zach. Very well done!!!! Amazing. You have been blessed with so many gifts, and writing is one of them. Just beautiful…leaves me with so much to contemplate–running-wise and life-wise. Nicely done. This is real, applicable introspection about life, running, and their relationship – quite a welcome break from the usual overworked ‘going into battle’ epic struggle self-congratulations associated with our decision to go run in the mountains from time to time. Thank you Jess and Zach, those are some simple but very wise words! When I think of noteworthy aid stations, one that jumps out to me is an aid station worker at the Marquette Trail 50 miler in 2015. It was my first attempt at 50 miles, and even though the race took place in late August (usually cool weather at that time of year in the upper peninsula of Michigan) we had a heat wave that weekend. It was unseasonably hot and by the time I reached the 21 mile aid station (Harlow Lake first bridge), I was getting cooked. I pulled out a buff that I had stashed in my pack and asked one of the workers if she could help me get ice cubes in it to go around my neck. She knew EXACTLY what I needed and like an experienced pro, she filled up my buff and rolled it up around my neck and sent me on my way. I was blown away by her calm efficiency and kindness. There was another aid station about 4 miles later, and much to my surprise; this SAME aid station worker had moved on that aid station. My ice had all melted by then, so I asked her for help and again she filled me write up and asked if there was anything else I needed. It was amazing! The race didn’t go as planned for me, and I missed a time cutoff at the 31 mile point; but I will never forget that aid station worker. When I think about aid stations of life, I remember back to 2006 when my sister Tami died from cancer at age 35. I was utterly devastated. She was 4 years older than me, and we were very close. That time of my life was brutal and painful, but I was surrounded by a massive tribe of friends and family who supported me, prayed for me, listened to me, or just sat by me while I balled my eyes out. Thanks for a great post, Zach, it was very meaningful to me to reflect on these moments and these people. Great write-up! Completing my 1st 100 miler, my only focus was making it to the next aid station. It helped tremendously, as contemplating the remainder of the race to the finish line would have been overwhelmingly discouraging. In one of those SEAL books that came out in the last several years (Lone Survivor?) the author talks about focusing only on the next meal during BUD-S, and that’s what got him through. I think it’s that way in life too. When in trouble, simply focus on reaching your next “aid station”, whatever that is for you on a personal level, and not beyond that. I love this writeup because of the humanity it shows. I have a million aid station stories, maybe the best of which came during the three-day Appalachian Extreme adventure race. After a 48 mile canoe leg and a short 27 mile mountain bike, it became clear our strongest teammate was getting annihilated. Sure enough, in the aid station, he threw up copiously, then everything came out the other end too. He got an anti-nausea injection, which caused him to pass out. I actually thought he was dying. We slept for 7 hours — utterly unheard of in a race — and then got kicked out of the station the next morning. We were not only in last place, we were 4 hours BEHIND the next slowest team. But as we were packing up to get a ride back to our car at race HQ, my buddy said, “We should try to finish this.” And that dude puked his way through the day, gradually got better, and over the next two days we passed a ton of teams for a competitive finish. True heroism. Zach, I wonder if there isn’t something in our design that needs an aid station now and again? As if the Creator put something in us to work against the desire to ‘go it alone’, to be self-sufficient, to rely on our own wiles and perceived strength, especially when things are tough!?! Thanks for your words … and greetings to all from Lancaster County! Reading this brought tears to my eyes. A really timely reminder for me, so thank you for publishing this article. I’ve not worked at an aid station in a race but I have marshalled many times and the pleasure of shouting encouragement, giving a hug or a high five and seeing a runner perk up a bit from that far outweighs the early start and standing in the cold for hours. We give and we take- we need to do both. 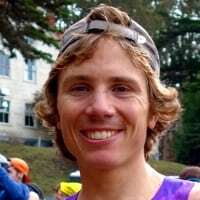 you’ve quickly become my favorite writer on iRunFar dude, thanks for the good stuff! Great writing Zach! Always a pleasure to read your stuff.